Home Tami with an I Progress! Well, I am so happy to be back from my cruise… not really, but that sounds like the right thing to say 🙂 . I have to get my pix developed (yes I’m still a 35mm girl) and then I will be able to write a blog about the trip. BUT, there is a product available to help. 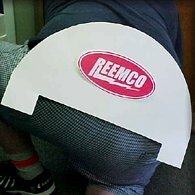 It’s the Reemco plumber’s shield. I may have to pick one up for John. Oh yes, it is good to be back! and that’s no john posterior. wally wants you in his office right now!